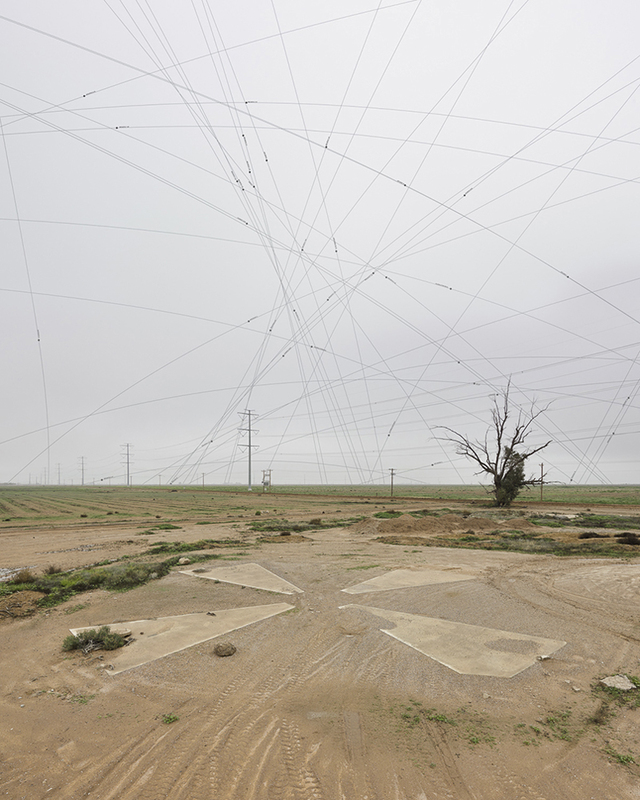 Damon Sauer and Julie Anand are collaborative artists based in Phoenix, Arizona who began working together in 2005. 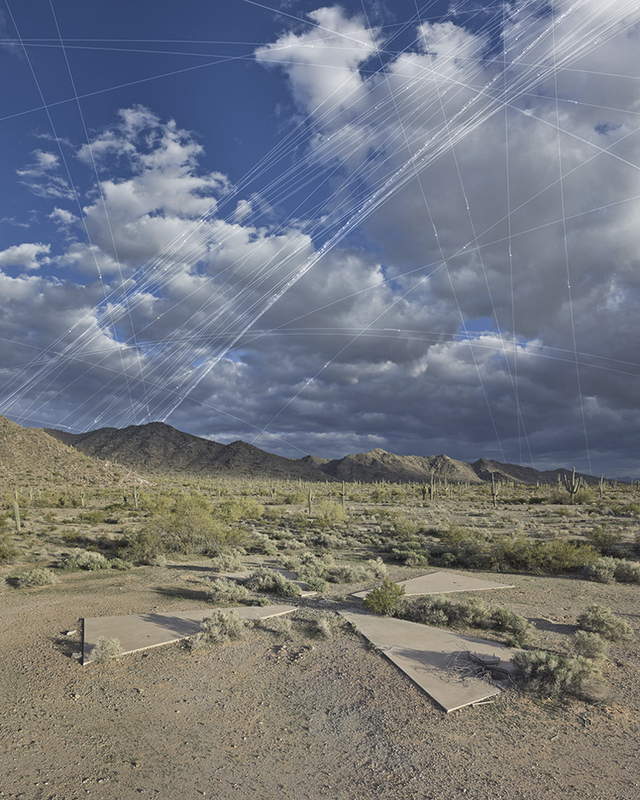 In their most recent project, entitled Ground Truth: Corona Landmarks, photographs of the Sonoran desert are digitally blended and juxtaposed with white lines arching through the sky that represent the paths of existing satellites. 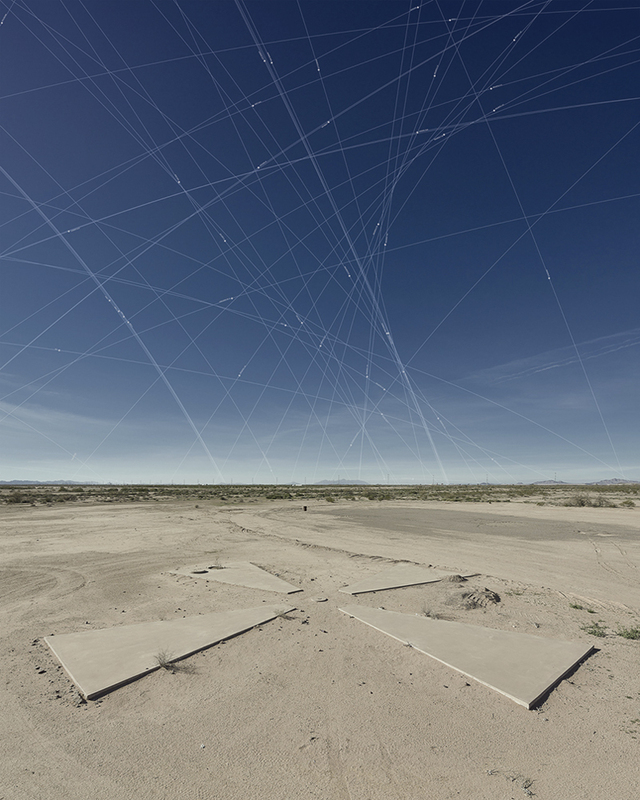 Marking the locations of each photograph are large, abandoned concrete crosses in the ground. 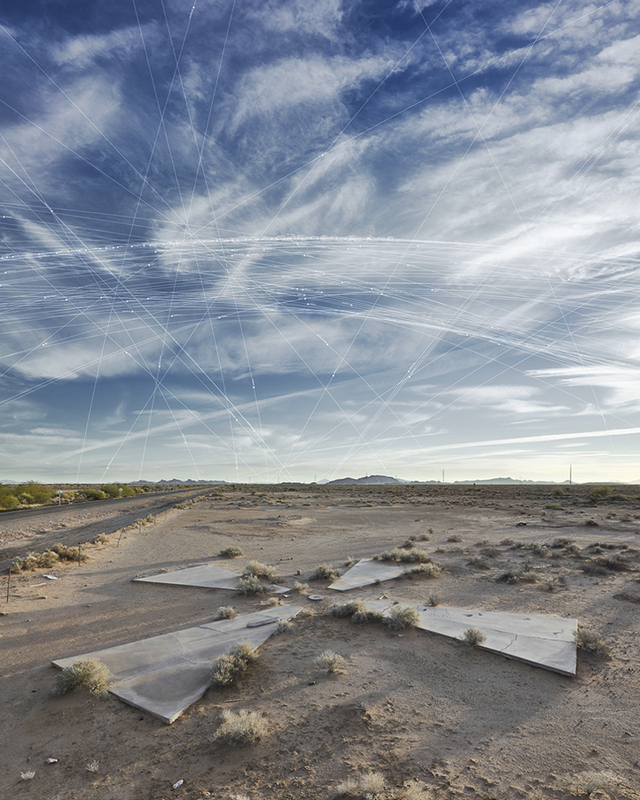 These landforms, created in the 1960’s in conjunction with the launch of Corona satellites, were used as satellite calibration targets for a top-secret U.S. spy satellite mission to monitor Russia and China. 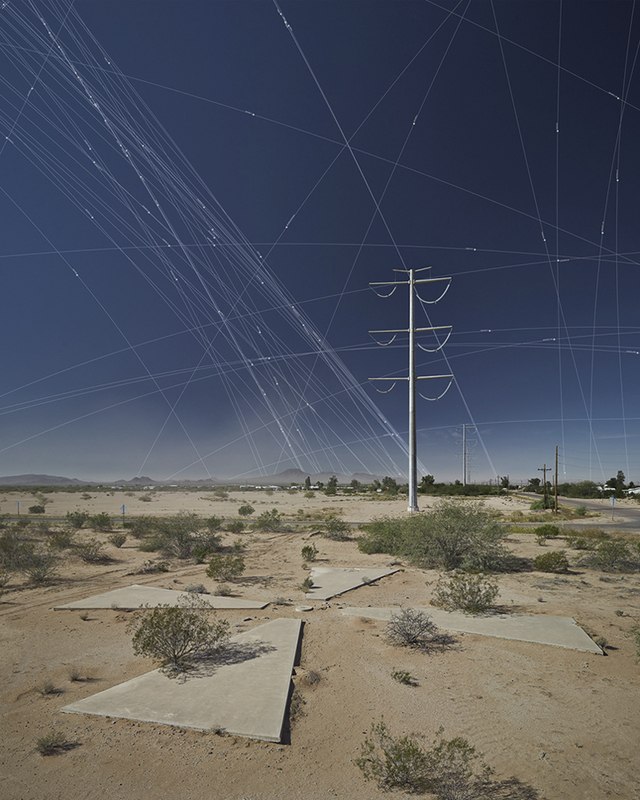 Ground Truth: Corona Landmarks sheds lights on the contrasting spectrums of past and present satellite technology; from its historical, secretive Cold War surveillance technological roots into today’s ever encompassing satellite tracks across the sky. Anand is Associate Professor in Photography at Arizona State University and Sauer is Assistant Professor of Photography at the Art Institute of Pittsburg—Online Division. Anand draws on her background in the natural sciences and she has developed a course at ASU cross-listed with the School of Sustainability called Art & Ecology. 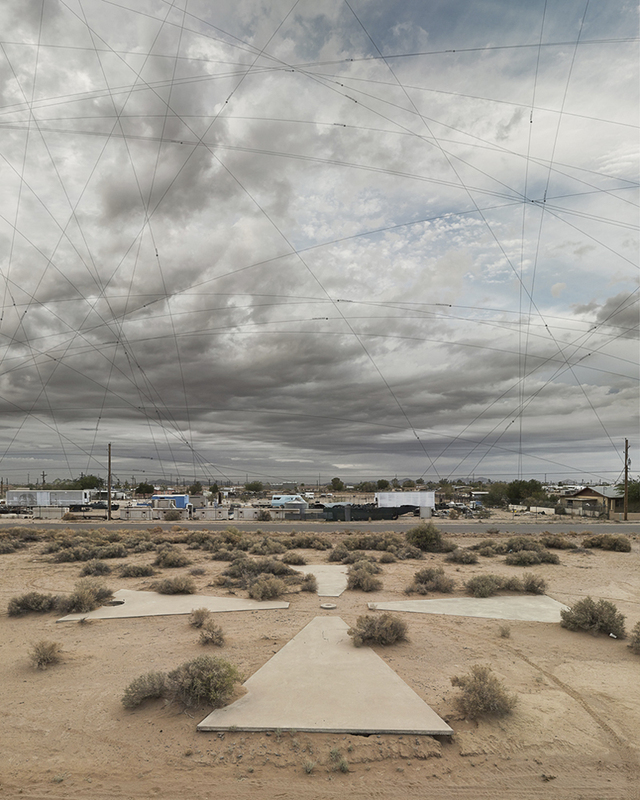 Anand and Sauer’s collaborative work has been exhibited widely including recent shows at Florida State University Art Museum, the Phoenix Art Museum, and the Center for Creative Photography, in Tucson. 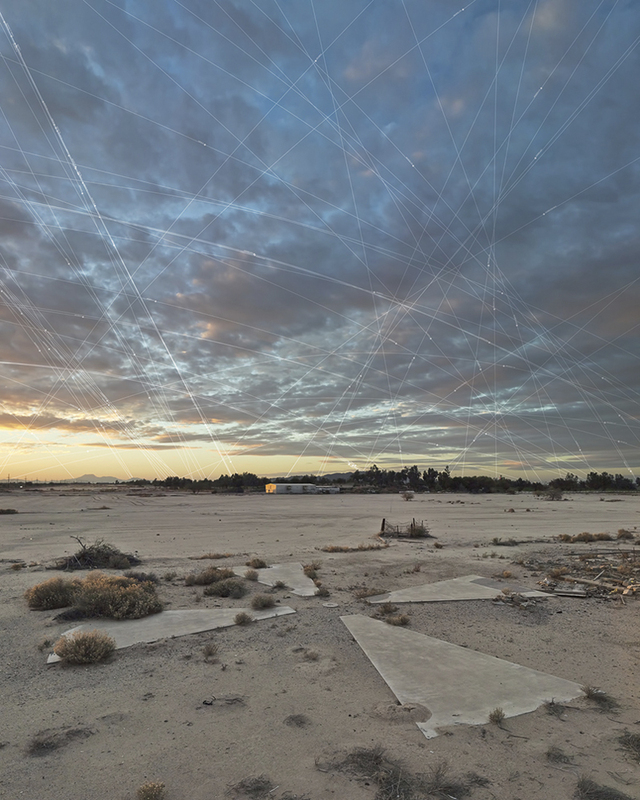 Their current project, Ground Truth: Corona Landmarks, was recently recognized through the international Lensculture Exposure Award and the national Sidney Zuber Award and Critical Mass Top 50. 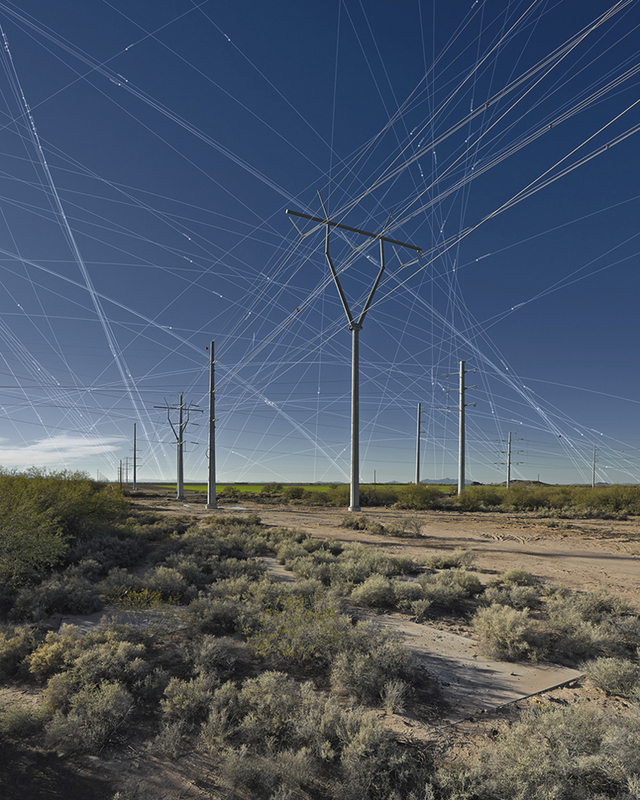 The project was recently featured on Wired magazine and Places Journal. 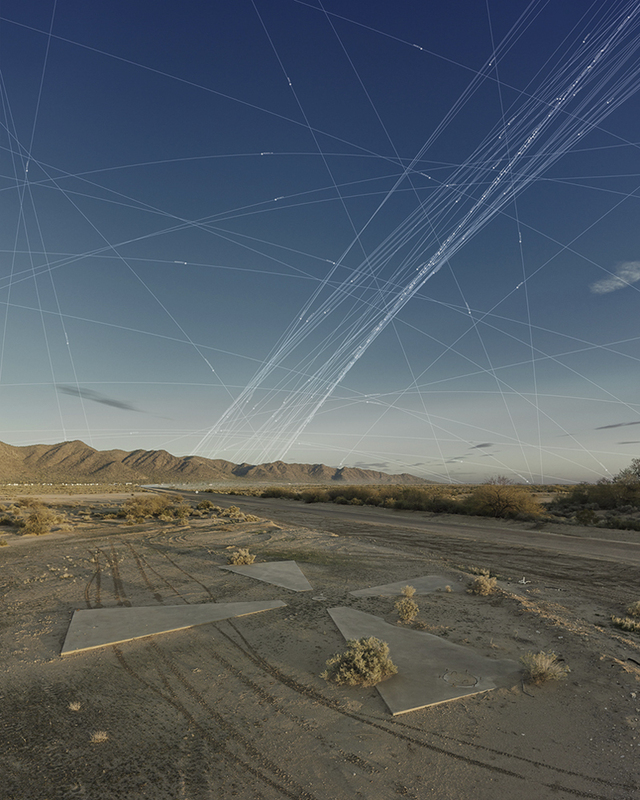 Ground Truth is supported in 2017-18 through the Land Arts Mobile Research Center/Andrew Mellon Foundation. 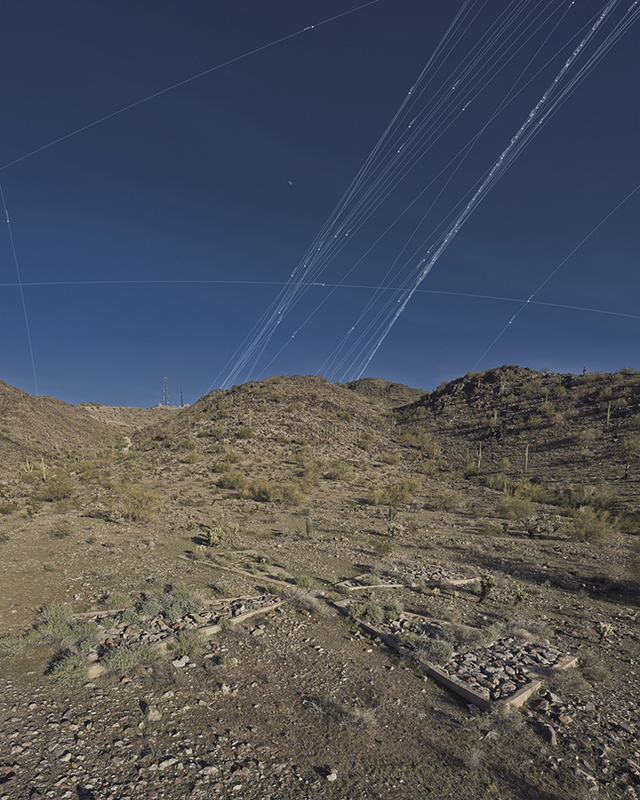 Ground Truth: Corona Landmarks, in its broadest sense, investigates an individual’s position on earth in the contemporary context of vast networks of information. 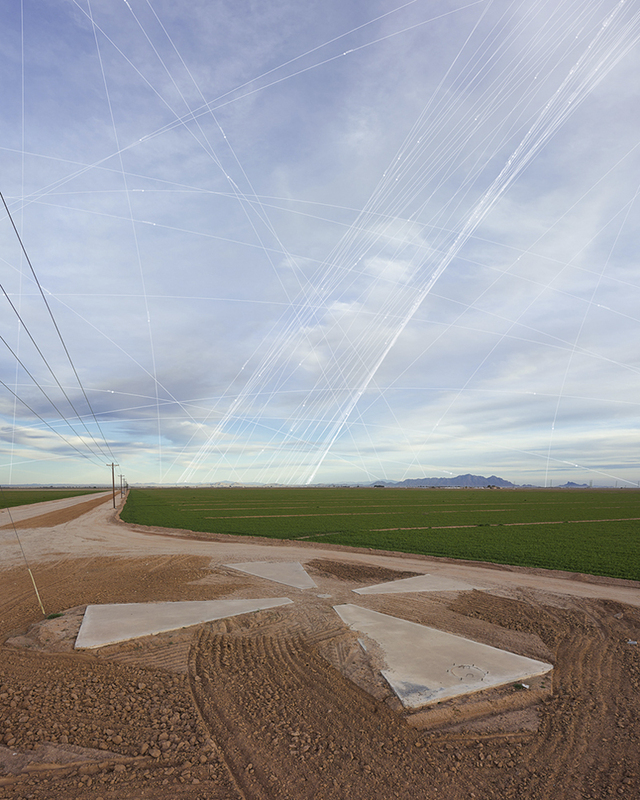 We explore this situation by visualizing the expanding pervasiveness of satellite technology in relation to an historically significant set of satellite calibration targets. 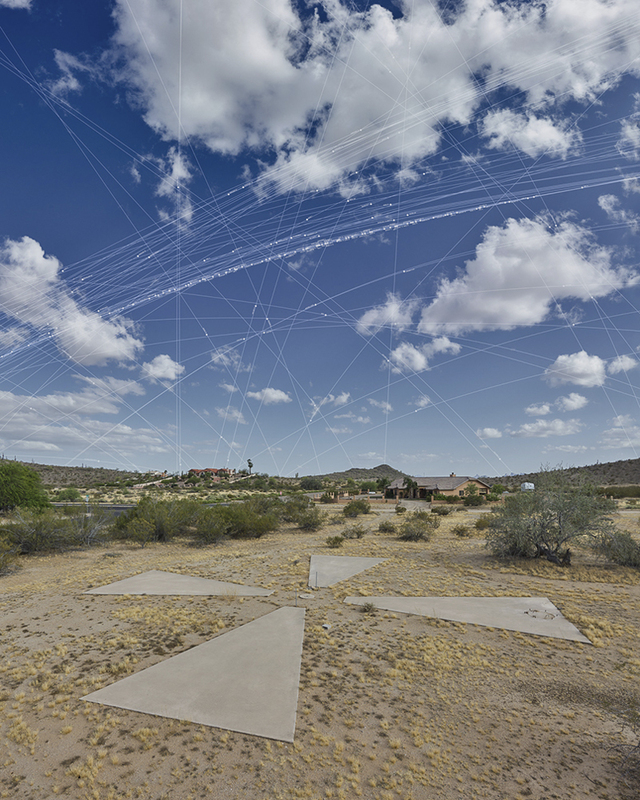 This system of calibration targets within the Sonoran Desert were created as part of a secret surveillance program in the mid-1960’s. The joint CIA/Air Force classified project known as Corona was a photo-reconnaissance program based on the recovery of physical capsules of ejected film and produced the world’s first maps of earth from space. 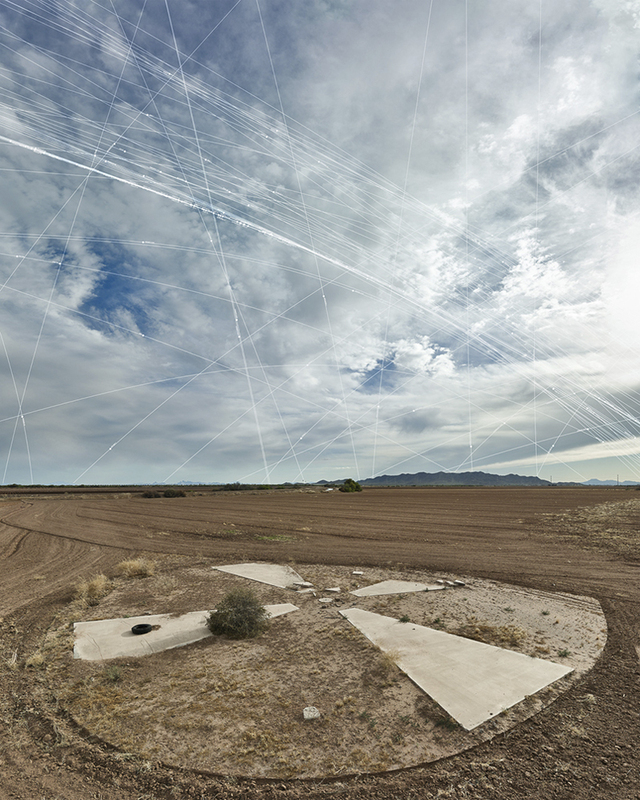 The sixty-foot diameter concrete forms we photograph are located one per mile within a sixteen square-mile grid, designed as an array of ground truth markers. We are intrigued by the way that these markers of space have become markers of time, representing a poignant moment in geopolitical and technologic social history. We privilege the skies in each of our compositions to give visual weight to the density of what is imperceptible miles above us. 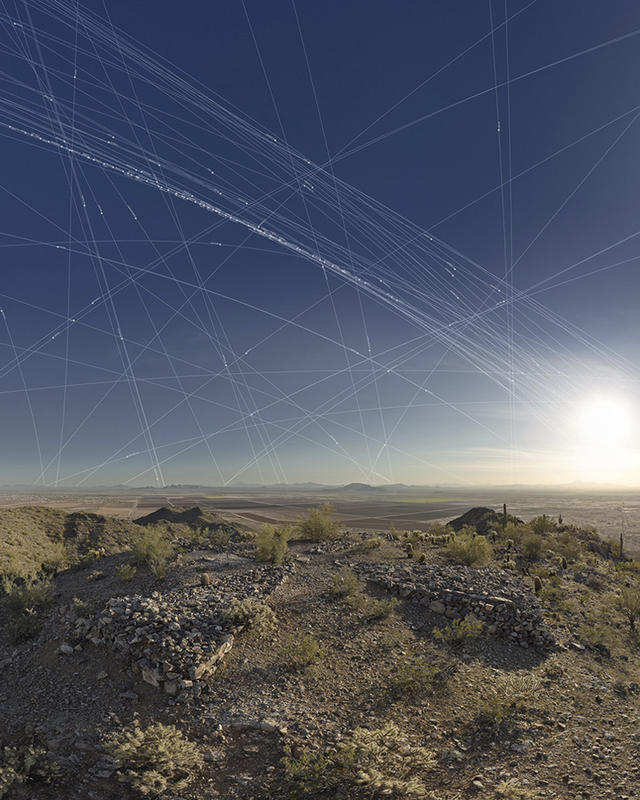 To further engage this idea, we map the specific satellites present in the sky at each site at the moment of photographing, using a satellite tracking application. We enjoy the way that these myriad points and orbital arcs emphasize the ubiquity of this contemporary technology encircling the globe. 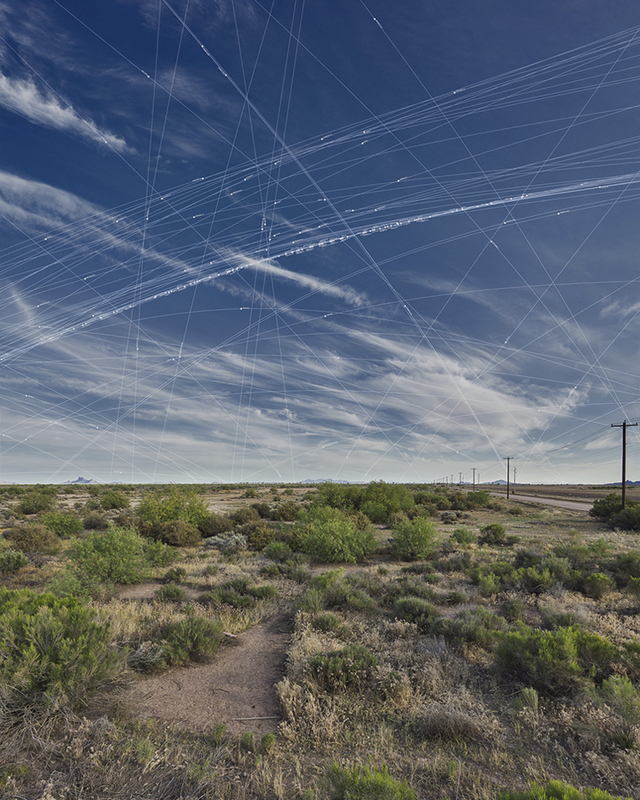 Individual satellite names are legible at each satellite location in the sky. The images are thus historic document, aesthetic artifact, and data map combined. We explore the remains of Corona architecture as demarking a rich anthropologic moment evidencing the human desire to see from above.